H. P. Lovecraft's creations have been creeping into D&D for decades. Find out which of your favorite monsters sprang from the mind of the master of supernatural horror. Keith Baker, creator of Eberron, describes nightmarish monsters from Eberron's realm of dreams. Sleep tight. There's more to keeping the dead down than wooden stakes and holy water. Find out what you need to bring the next time you try tomb robbing. Learn what every necromancer knows by heart. Find out what monsters you should kill to get the best undead minions. Take comfort from fears of these chilling creatures by reading the secrets of these cold-based monsters. Neil Gaiman's novel of modern myth provides inspiration for D&D games. 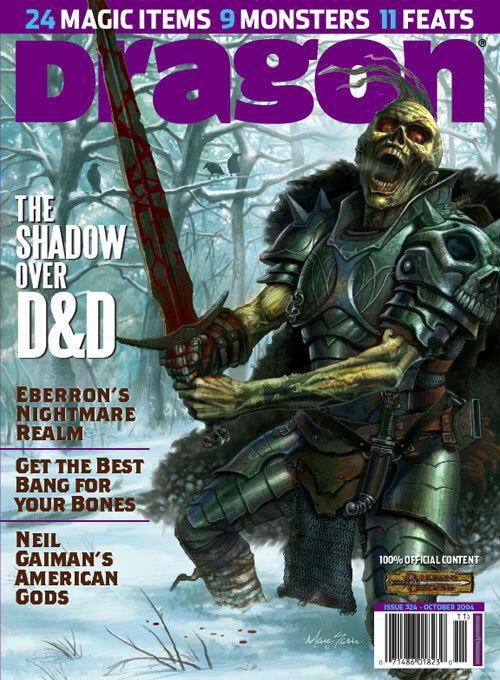 Plus, "The Ecology of the Nighthag," "Spellcraft: Illusion Spells," "The Magic Shop: Cursed Items," "Winning Races: Grippli," "Gaining Prestige: Sworn Slayer," "Player Tips," "Adventurer Tricks," "Class Acts," and more! Sign in to start a discussion about Dragon Issue #324!